Girlhood [Bande de filles] opened the Directors' Fortnight at the last edition of Cannes  with an excellent reception. Should one see in its success a celebration of ethnography-style clichés or the recognition of the individuality of an experience? What is interesting about Girlhood is precisely that it avoids clichés, or rather that they are reworked to go beyond them. Yet this timorous black teenager who realises that the only way to escape her fate is to fight, could have fallen into the ploy of preconceived ideas. That this does not happen is due to the subtle way the story is told, but above all to Céline Sciamma's aesthetic choices: the camera close to the body gives a soft feeling, capturing gestures and glances with framing that highlights the beauty and humanity of the characters. Marieme who in the gang becomes Vic (Karidja Toure) is in all the shots, the film constantly following her point of view. This identification with the heroine is not only an emotional one, but it is also political. While it is the group who goes through an initiation, it is Vic who must experience the solitude that will allow her to define herself and go beyond it. Her painful journey, which entails a series of rejections, illustrates the possibility of reinvention, allowing her to step out of a predestined path, and to leave the immutability of the housing projects. It is she who forges her own destiny and not because she is forced to do so. 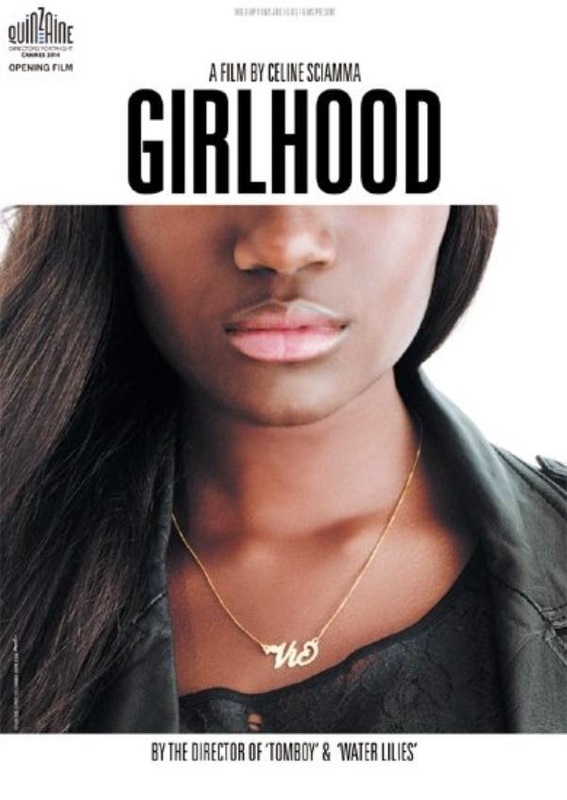 While Girlhood is set in the outskirts of the city, it has none of the codes of the "banlieue film"; a term used to designate films that reduce these spaces to clichés. It is not shot with a handheld camera and drenched in rap music. The film does not try to prove its legitimacy. Rather, it works in scope mode stylised with lustrous colours, using tracking shots and steadycams or placing the camera on a tripod for episodes tending toward sequence shots. This approach allows Vic to have a romantic destiny. Female violence is not new (though really never recognised), what is new (and which dates from the time when Nicolas Sarkozy was interior minister), though still minor, is the phenomenon of girl gangs. Vic and her friends are neither sweet nor maternal. Loud and strong-minded, they express a political violence, fighting against all rules and assignations. They are all black, as are the boys who they frequent. Again this is a political choice of representation of this invisible sector of multicultural France--in this French society, when Vic can finally play a video game with her brother, and given the choice between Brazil and France, she chooses France without hesitation. Hence, it is not neutral to choose black teenager girls to express what is the basis of Céline Sciamma's cinema (Water Lilies, Tomboy): the construction of femininity, the affirmation of desires, the negotiation of identities. As it relates to her objective, she finds in these girls the requisite vitality. If Girlhood assists the girls that it presents on screen, it is in being aware of their wonderful energy, it is in filming—without locking them in the stereotype beyond what they themselves are working to resist—their gestures, their dance, their speech, their symbols, and the spaces that they create—such as the hotel room that they book in order to be together. There is rage in this energy, and it is this rage that will allow Vic to leave the over-determinism of her social environment, and cinematically—to leave the frame. Transgression, a beautiful programme!